Neko Chuudoku is Tegomass’s 7th single and it was released on May 22, 2013. This was their 2nd single in 2013 following their previous single released in March 2013, Sayonara ni Sayonara 「サヨナラにさよなら」. The direct translation of Neko Chuudoku is basically “Cat Obsession”. Limited Edition A comes with the song Neko Chuudoku itself, as well as a テゴ.カラ、which stands for Tegoshi Karaoke. So that means that Only Tegoshi’s voice shows up on this track, rather than a regular Karaoke or both of them singing on the track. It also comes with a DVD of the Music Video and Music Video making. Limited Edition B comes with the Neko Chuudoku song, as usual, and this time マス.カラ、which stands for Massu Karaoke. So this time its just Massu’s voice on the track. 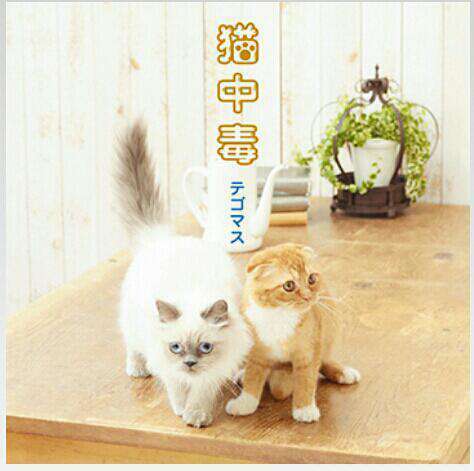 The DVD that comes with this edition contains the dance version of the Music video as well as “Tegomass Sensei Catness” video, which is them teaching the fans how to dance the dace of Neko Chuudoku. Fun fact, if you press the cartoon cat on the DVD menu of this edition, it will give the whole dance music video of them facing backwards so that you can follow along dancing with them! The regular edition only comes with a CD but it contains 2 extra songs, plus the real karaoke track for Neko Chuudoku that doesn’t contain any vocals at all. The 2 extra songs are 「シュプレヒコール」”Shipurehicoru” (which means speaking in chorus, or together) and 「花に想いを」”Hana ni Omoi wo” (which means “Expressing feelings with flowers”. Neko Chuudoku is a upbeat “Ska” like song that really leaves you wondering “What the heck just happened in this song?” LOL! I truly love this song, when some others don’t, but I will say that its not my favorite song from Tegomass. Tegomass diverted from their normal type of music a bit and decided to do a dancing (well…. sort of dancing) song this time. Normally they have more mellow-like songs they release as singles, and on their album they have some other upbeat songs, but this is the first time they released a single with a really upbeat feel to it. The only exception to this I can think of is Tanabata Matsuri, but that wasn’t even upbeat as compared to Neko Chuudoku. It’s also really short compared to other Tegomass songs they have released in the past. I normally don’t pay too much attention to the B-sides on singles sometimes until they are performed live or they have a significant impact on the fans and this time was no different. I didn’t listen to the B-sides of this single closely until I heard them during the live performance of their 4th Live Tour, Tegomass no Seishun. After they performed these songs at the concert, I fell in love with both of the songs. シュプレヒコール」”Shipurehicoru” is a very easy listening song with a violin- like sound in the background and very nice guitar and piano. The vocals and harmony is amazing and the rhythm of the song is amazing as well! 「花に想いを」”Hana ni Omoi wo” is a different type of song that reminds me of the American south and spring and summer with a harmonica, guitar and fiddle- like sound in the background! The Music Video is very different from their past videos, as a reflection of the different style of song that they were trying out this time. I like how in the full version of the music video, they start out from being “cool” and then all of a sudden change into the big Cat Costumes and start dancing a cute dance and doing crazy things that they interpret themselves from the lyrics of the song. It’s vibrant and colorful and is a stark contrast to the previous single they released 2 months prior, Sayonara ni Sayonara, which was very mellow and them just singing without much movement. I am looking forward to when they have a concert to see how they will incorporate Neko Chuudoku into the normal way they do their concerts because they normally don’t dance (except for 1 song). I kinda wonder if they will actually wear the big cat costumes during the concert because they wore them in all of their promotions for the single release. Another cool thing they did different this time was the “Tegomass Sensei Catness” video. On the LE B Edition, Tegomass teach you the dance to Neko Chuudoku themselves in a cute way that is very Tegomass like. I like that they did this because this IS their first dancing music video and the fans probably would want to learn the dance to it. The making of the Music Video was different this time because they put humor into it by having a competition between Tegoshi and Massu that was based around cat like things. They didn’t do it all at once either, so it made it interesting to do some behind the scenes and then some competition interchangeably, with a punishment game for the looser of the competition at the end. The last thing that I liked is how they continued to do the TegoKara and the MassuKara thing. They started to do this with Sayonara ni Sayonara and they continued to do so with Neko Chuudoku. I really like this because I can sing the part that I like to sing and not feel awkward just with the regular Karaoke track and I can “pretend” that I am singing a duet with either Massu or Tegoshi. I think a lot of the fans feel the same way about it as I do and it became popular so they continued to do it on this single. I hope they continue to do so in the future because that was a brilliant idea! I think Tegomass did a good job with this song and shook things up a bit by bringing something different to the table. The one thing I will say though is that I don’t know if they should have released it at this time because their previous album Tegomass no Mahou and their single before this Sayonara ni Sayonara were a huge step towards being more “Adult Cute-like”, and then they went straight to something like Neko Chuudoku. If someone wasn’t a Tegomass fan before, they might have been confused at the difference and not liked it. I personally love this song, but I think if they wanted to keep up with their image they should have released it before Sayonara or just not released it at all. All in all, as a decently long time fan of Tegomass, I like how they shook things up and I am looking forward to when they release a new album because I want to see how they want to present themselves after 2 years! What are your thoughts? Feel free to tell me in the comments below or tweet me! *DISCLAIMER* I am still learning Japanese and these translations of these song titles, Japanese content, or any other translations from Japanese aren’t perfect. Please bring to my attention if you think I have any errors. Thank you for this Review~ ^^ TBH I didnt like it at first *runs away* but then as i listened to it more i was like…”WHAT KIND OF SORCERY IS THIS?” LOL XDD i was hypnotized like a neko! and i started enjoying it, plus the super duper cute MV made me love it more HAHA! More than neko chudoku, i like the other songs in RE like Sprechchor :)) pii~su! You’re welcome!! Thanks for commenting! I like hearing other people’s opinions on it! I also love Neko chuudoku. Some fans thought that it was wasting their voice ….but I think this is quite perfect for Tegomasu. Tegomasu never have been completly black or white. So it was perfect ( + my godaugther and her sister loved to watch the PV so much XD ). I love the serious Tegomasu but I really love overly cute Tegomasu too. Remembered me of Chu chu chu. Same kind of funny song ! I usually listen to B sides …but I didnt like at first ”花に想いを”. It sounded too westernish for me. ( Cowboy and stuff like that lol ). But after seeing it in Seishun tour …well I fell for it !! I just cant wait for the DVD release to be able to see it again ! Sadly they didnt wear their costume for the show …Guess it would have been a little too complicated XD ( And hot …poor Massu lol ). But it was so cute in live and funny to try to dance it in the crowd. The punishement was Hillarious. And Massu being ”Yokkataaaaaa” XDDDD. I hope they can do an other dance song like that. It’s so funny. Doing a dance version was perfect too. i wish they would do that for each songs ( NEWS for exemple ).